Ford Territory. 2018 to date (prod. n/a). 5-door SUV. F/F, 1498 cm³ (I4 DOHC). 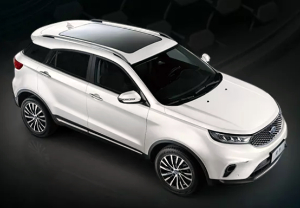 Ford revived the Territory name for a compact crossover in the Chinese market, built and initially developed by JMC, and based on its Yusheng S330, but with a Ford grille and a reworked interior. Plenty of active safety features, and Ford Ecoboost 1·5, including models with mild hybrid functions thanks to a 48 V battery (supplying an extra 10 kW and 54 Nm), though overall, power delivery was below average.